Whether you are looking for a domestic or international flight, you will be guaranteed to find the flight you are looking for using our unique flight bookings system. It is totally free of charge and only takes a few minutes before you have completed your flight bookings online. We conveniently compare every single airline instantly for you so that finding a flight is a simple and painless process, bringing you every day savings. Essentially we compare flights from all airlines across all destinations to give you the freedom to choose the most suitable flights. Booking flights has never been easier! Complete the online booking form, make payment and SAVE! 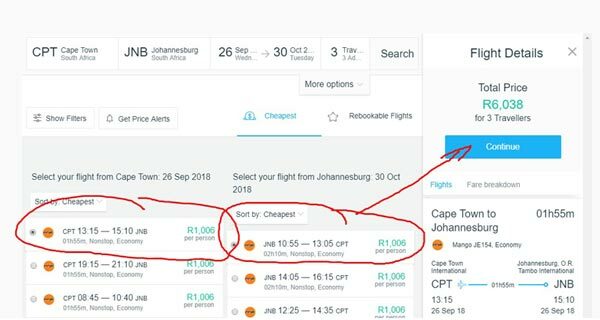 Flight Bookings South Africa Has Never Been Easier! Complete the outbound and inbound departure and destination cities. Lastly, click the ‘Search for Flights’ button to proceed and view the available flight options. 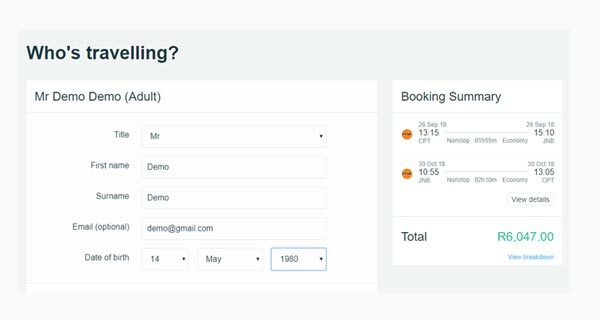 Watch our video and see how easy it is to make your flight booking online! When you have clicked the ‘Search for Flights’ button you will be given a list of available flight options including dates, times and airlines. The flights are listed in ascending order based on price. This is where you decide whether or not you want to use your favourite airline or the cheapest flight. We now have added an incredibly powerful FILTER for you to utilize to make your flights booking experience that much better. Choose the flight that you would like to book and click ‘Show Details’. A drop-down screen will appear displaying a more detailed flight itinerary. You will be able to see outbound as well as inbound flights and the exact times of each particular flight together with the flight number and class. If you are not happy with the details of this particular flight, please click ‘Show Alternative Flights’ for more options to choose from. After this you will need to click ‘Select Flights’ to proceed. A new screen will appear summarising your flight itinerary. Below this you’ll see your fare breakdown and the total flight bookings price. Click ‘Book’ to continue. Lastly, complete the traveller booking form detailing names, addresses etc of all passengers if there is more than one. Be sure to include your payment details. Then confirm your booking to make the payment. Once payment has been confirmed for your flight bookings, once your credit card transaction has been processed or the money you transferred has reflected on our account, you will receive an e-ticket email or, for certain low cost carriers, a confirmation email with a reference number. There you have it. A simple step by step guide on flight bookings showing how easy it is to save time and money on your travel experiences. Please remember that we offer excellent car rental facilities as well as hotels locally and internationally.